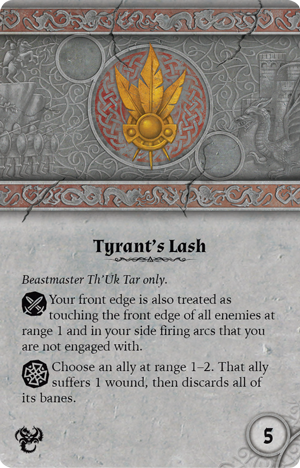 Order your own copy of the Beastmaster Th'Uk Tar Hero Expansion at your local retailer or online through our website today! From his infancy, Th’Uk Tar’s parents knew that he was destined for great and terrible deeds. He was born to an ancient Uthuk tribe, and the moment his mother saw his hooked legs and razor-sharp fangs, she gave thanks to her Ynfernael masters and took the child to the heart of the Ru Darklands, where he was left to grow hard and strong in the inhospitable wastes or die. For three days, the child was left to the mercy of the elements and the creatures of the Ru. But he did not whimper or cry. He simply stared at the world around him, watching. Waiting. On the fourth day, a caecilian discovered the babe beneath the spines of a bloodthorn bush, and rather than devour him, the creature took the child away and raised it as its own. Years later, Th’Uk Tar returned to the village from whence he came, accompanied by the caecilian and a pack of flesh rippers, all loyal to their bonded master. Now, as the four great factions of Terrinoth clash, he prepares to lead his new pack to war. 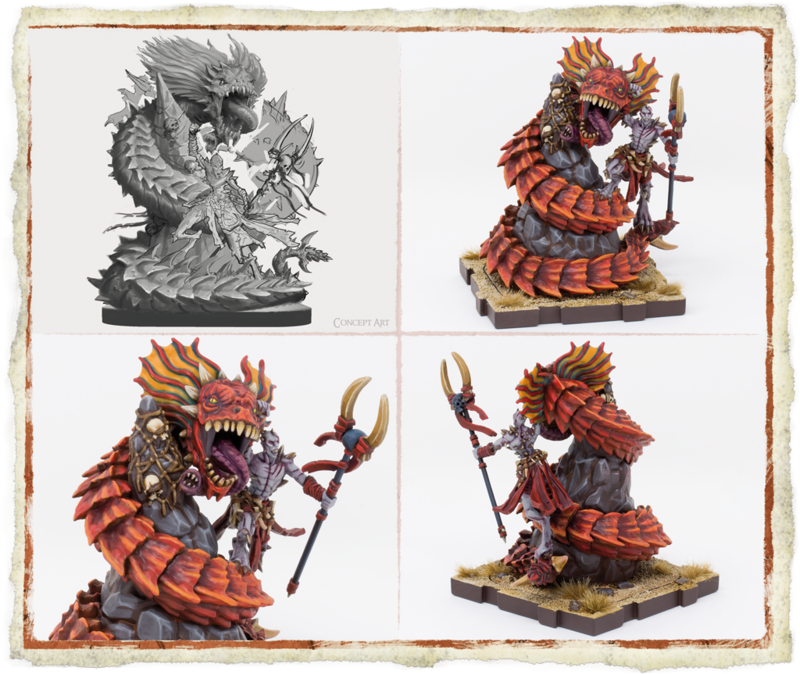 Today, we're pleased to offer you a closer look at the Beastmaster Th’Uk Tar Hero Expansion for Runewars Miniatures Game—now available for pre-order at your local retailer or online through our website! 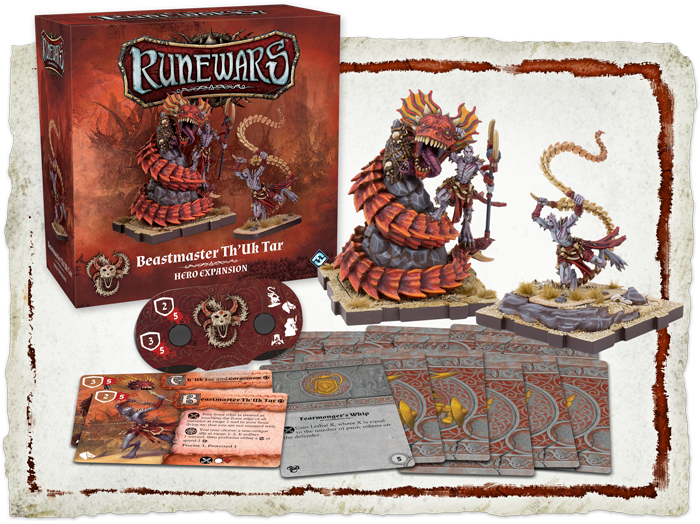 The Beastmaster Th’Uk Tar Hero Expansion provides you with everything you need to add the merciless master to your ranks, including two miniatures and unit cards so that you may send either form of the hero to lead your locust swarm, as well as one command tool, a collection of tokens, a new terrain piece, an objective card, and a deployment card to further customize your battles. 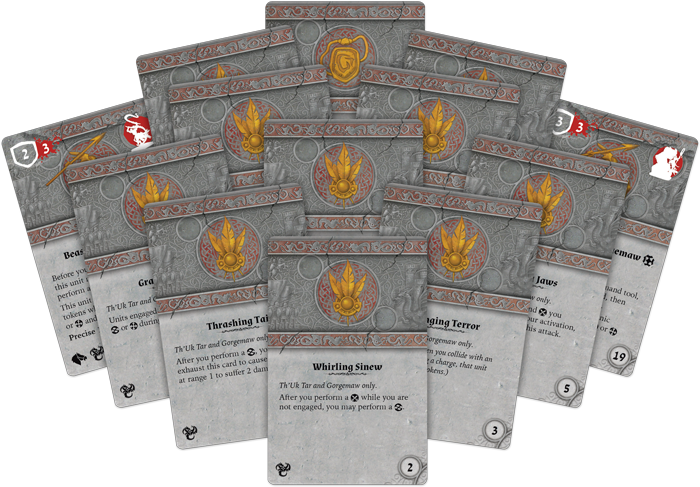 In addition to these implements, you will also gain an incredible thirteen upgrade cards for Th’Uk Tar to increase his effectiveness on the battlefield, whether he is fighting alone or alongside Gorgemaw. When he stands alone to lead the beasts of the Ru onto the battlefield, Th’Uk Tar can greatly increase the maneuverability of Flesh Rippers and Spined Threshers. Before the battle even begins, Th’Uk Tar can use his skills as a tactical leader of the Uthuk to call the beasts to heel, drawing any non-unique ally close to him, even if they have already deployed. This offers your Uthuk horde an unprecedented ability to adjust your battle plans once you have seen your enemy’s positioning. Then, once the bloodshed begins in earnest, Thu’Uk Tar can use his twin whips (made from the spines of two Flesh Rippers he deemed too weak) to lash at enemies and allies alike, forcing all to bend before his will. 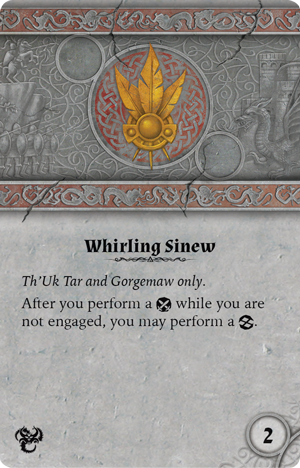 As a skill action, Th’Uk Tar may lash a non-unique ally within range of his whips, forcing them to suffer one wound and allowing them to reform or shift. 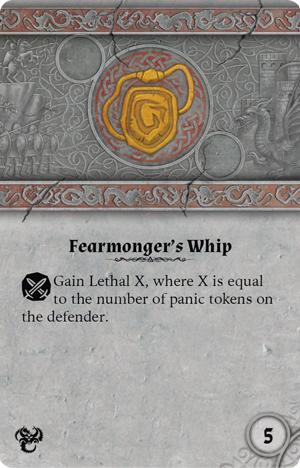 You can further hone Beastmaster Th’Uk Tar’s unit card ability by equipping him with the Fearmonger's Whip, which uses his enemy’s fear to give him the Lethal keyword, or with the Tyrant's Lash. This vicious technique allows the Uthuk Hero to treat his front edge as touching the front edge of all nearby enemies in his side firing arcs, rather than just his front firing arc. 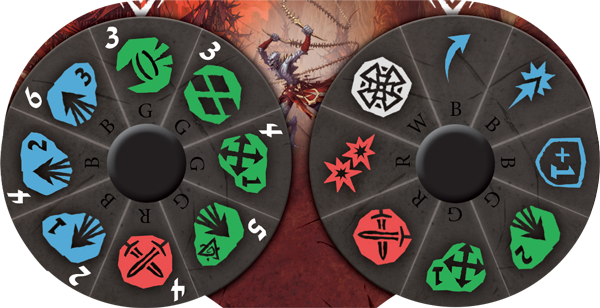 Additionally, as a skill action, where Th’Uk Tar can normally only punish his allies to force them to move, this upgrade lets him whip an ally to have them discard all their banes, for a small blood price. While Th’Uk Tar is an undeniable threat in his own right, a Beastmaster of the Ru is never respected without a truly monstrous ally to strike fear into the hearts of those who would threaten his authority. In the case of this Uthuk hero, he is often accompanied by the very beast that raised him, Gorgemaw. 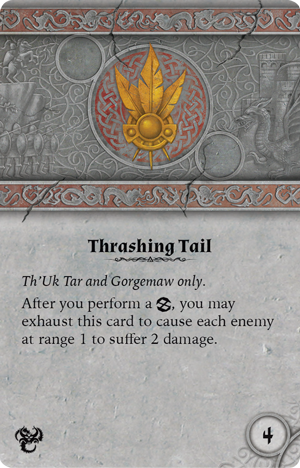 Should you choose to send these two into battle together, Th’Uk Tar and Gorgemaw have their own unit card with costs, keywords, and abilities distinct from those of Beastmaster Th’Uk Tar. For example, while Beastmaster Th’Uk Tar can increase the mobility of his allies, Gorgemaw can increase the mobility of Th’Uk Tar himself, allowing him to easily modify his march or shift actions without even using his command tool. By relying on his connection with the beasts who have mastered the inhospitable lands of the Ru, Th’Uk Tar can rival the agility of even the Latari’s mighty Leonx, which the Beastmaster hopes to soon add to his pack. Even when Th’Uk Tar does not bear his vicious whips, enemies would be fools to step too close to him and Gorgemaw with the caecilian’s Thrashing Tail that can cause two damage to each nearby enemy when he performs a reform action. This upgrade can be further synergized with Whirling Sinew which allows the creature to perform a reform action after he uses his unit card ability to perform a melee action while not engaged. For the ultimate devastating blow, Th’Uk Tar and Gorgemaw can dial in two melees into their command tool while unengaged to attack a nearby enemy, reform and deal two more damage, and then execute the entire attack a second time! Now, Th’Uk Tar drives his new pack to war. As he stalks across the field, Gorgemaw is never far from his side. When he howls, packs of flesh rippers and spined threshers bound forward, eager to slay at his command, and the Uthuk have learned to fear his lash, preferring to fall to their enemies’ spears than suffer Th’Uk Tar’s wrath. As the Beastmaster marches out of the Darklands, his gaze is fixed on the Aymhelin. The brave Latari will cower before the might of the Uthuk and once their people have been wiped from the world, their once-loyal animals will be added to Th’Uk Tar’s pack, increasing his power until none can stand against him! Th’Uk Tar has seen the full terror of the Ru Darklands and he has not only survived, he has thrived. Now, he will proudly lead his monsters into battle on your behalf, showing all of Terrinoth the full power of the Uthuk Y’llan. When the cruel Beastmaster unleashes his pack, all will submit to his will or be consumed! 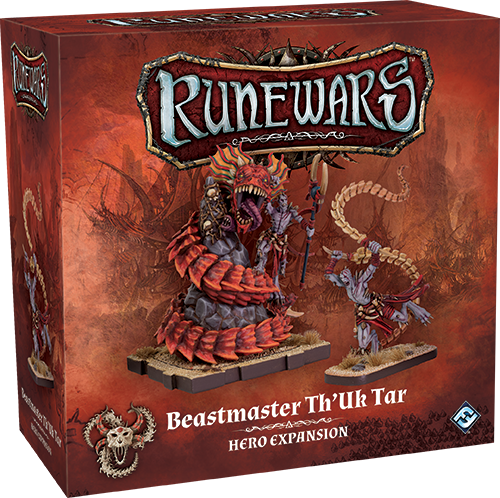 Pre-order your copy of the Beastmaster Th’Uk Tar Hero Expansion (RWM33) at your local retailer today or online through our website here! Enter a world of blood and war with Runewars Miniatures Game, a two-player miniatures game set in the vibrant fantasy realm of Terrinoth. Each game, you must command your blocks of figures, outmaneuvering your opponent and fighting to crush his forces on the field of battle. With hundreds of ways to customize your army, including by painting your figures, you can bring your army to life as you lead them to victory against your foes.